Rosé Piscine is the original, still French rosé specifically made to drink over ice. As Rosé Piscine is served on the rocks, piscine-style, there is no need to pre-chill the bottle. The bottle is encased in a protective sleeve to safely serve poolside or at the beach. As of 2018 Rosé Piscine is available online and at hundreds of fine liquor stores. 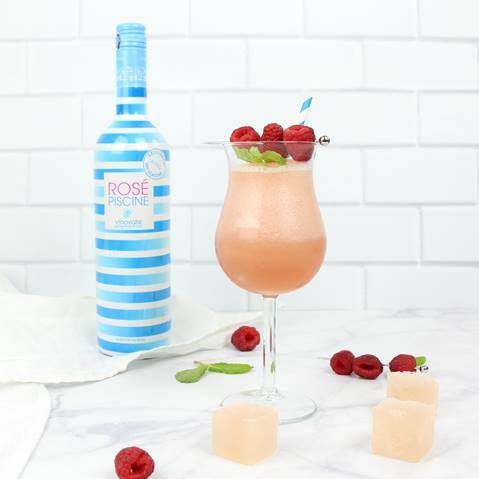 You must try this brand new invention: the summer cocktail Lychee Frosé Piscine. Deliciously refreshing, the cocktail features fresh fruit notes as it mixes lychee, grenadine syrup and ice. Check out your new favorite summer drink emerge, as the blender revolves it. 6. Blend, decorate with red berries, and enjoy!